Contact me to receive images of new paintings/prints. 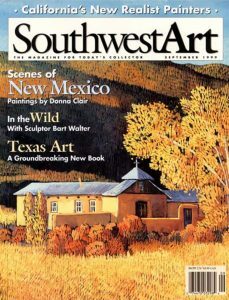 Southwest impressionist painter Donna Clair moved from Chicago to Santa Fe in 1967. For the past fifty years the mountains of northern New Mexico have been her home and the inspiration for a large body of fine work. Her trips to Mexico and Guatemala have also become part of who she is as an artist. Two routes join Santa Fe and Taos, New Mexico. The most traveled is N.M. Highway 68 which follows the dramatic plateau above the Rio Grande Gorge. The alternate route, called the HIGH ROAD by locals, meanders through the Blood of Christ Mountains — Las Montañas de Sangre de Cristo – winding past centuries-old settlements rich in Hispanic and Native American culture. Donna Clair moved from Santa Fe to the mountain village of Truchas, and has lived and painted in Taos for 30 years. by Donna Clair, written by Jean Ciavonne. University of Wisconsin Center for Latin American Studies. 1991 Oct./Nov. issue FOCUS/SANTA FE “The Beauty that Abounds” by Nancy Ellis.